Last year more than two and a half million people lined the streets to watch, and next year promises to be even bigger. 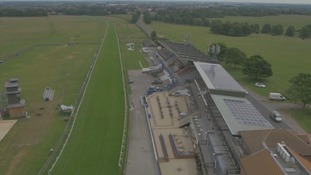 Beverley Racecourse has revealing plans for a new grandstand which will be the largest single investment in the history of the venue. White vehicles on taxi ranks across the East Riding will be sporting green markings and display a Yorkshire rose symbol. Waste and recycling teams will be placing tags on the green household waste bins of around 4,000 properties. East Riding Council are holding a debate on fracking today. Councillors there want the government to guarantee the region won't be unduly targeted for controversial gas extraction. Controversial plans to increase the size of North Ferriby by almost a third have been refused. National property developer St Modwen wanted to build 510 houses in Melton Fields on countryside next to the village. Following a huge campaign by local residents, with 2000 either signing a petition or sending a letter to the local authority, East Riding planners rejected the scheme. East Riding - click here. The consultation process will end today over the possible closure of three schools in East Yorkshire. Hundreds have protested against the plans by the local council to close down Dunswell Primary School, and primary schools at the villages of Langtoft and Gembling. East Yorkshire Council says Langtoft Primary School costs £15,500 per pupil to run compared with the average of £3500 for the rest of the local schools and it has to make difficult choices in tough times. Campaigners have handed in a petition of nearly 3000 names in protest at the plans. The cobbles in an East Yorkshire marketplace are going to be torn up and replaced with modern block paving.